I'm making a set of pages for each of a series of trees. 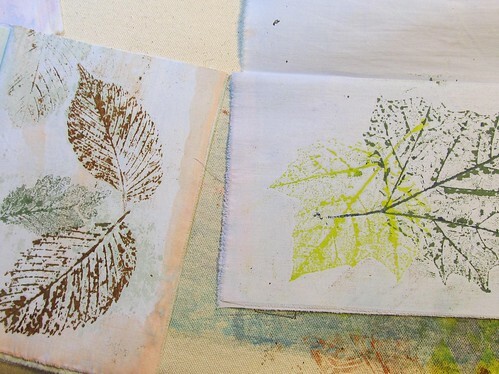 You've already seen some of the pages for oak, these are leaf prints for sycamore and elm. I think I am working from an individual tree for each set of pages. Each bunch of leaves came from a specific tree. I made a lovely discovery: after calling the set of pages the oak folio, I thought I should go look up folio and make sure I was using it correctly. To my delight, I was. Wikipedia says a folio is a pamphlet or book made up of full sheets of paper folded in half, printed on each of the four pages that result. Folded sheets can be nested to make gathers, and the gathers can be stitched and bound as signatures. Since I am working with full sheets of, well, sheet actually, and folding them in half and nesting them to make signatures, they really are folios. The pages are old sheets ripped to a reasonable size, and painted with accidentally colored gesso.